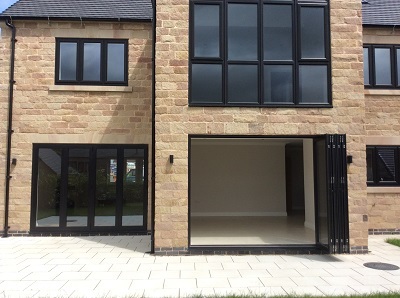 Bi-Folding Doors in Aluminium or PVCu are the ideal way to maximise extra space and connect inside living to the outside world. Bi-Folding doors can create a whole new feel for your home, linking rooms together and seamlessly joining inside living with outside space. Versatile and aesthetically pleasing, bi-fold doors are the ideal replacement for existing sliding Patio doors or French doors to flood any room with natural light. Amazingly flexible, bi-fold doors can be fully opened, partially opened or totally closed, depending on the amount of space required. Doors fold effortlessly gliding on stainless steel rollers allowing unrestricted thoroughfares and the maximum use of space and light. With easy access in summer and a wonderful view in winter, bi-fold doors add light and air all year round. PVCu Bi-Fold Doors in White, Anthracite Grey, English Oak, Rosewood, Mahogany, Cream, Ivory, Black, Light Grey & Chartwell Green Woodgrain Foil Finishes. Aluminium in Standard colour options including White, Black and Grey or for a surcharge any RAL finish and Dual Colours combinations. .All backed by our fully comprehensive Ten Year Guarantee.